UDM Downloads > Christmas Bells 3D Screensaver! 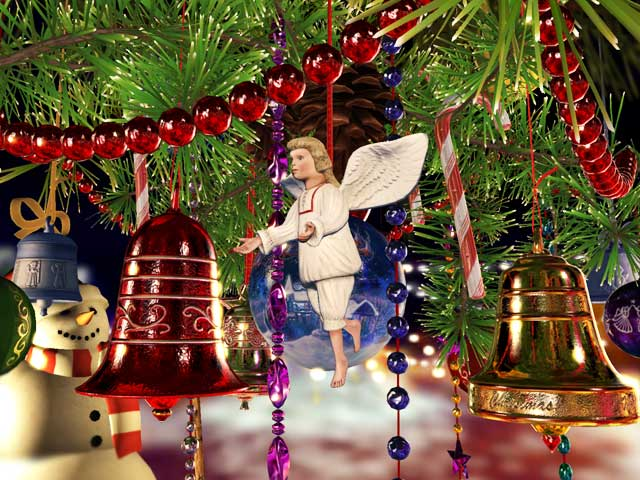 Christmas Bells 3D Screensaver is a great present for you and your friends on Christmas Eve. The most wonderful time is soon to come and you will certainly appreciate things that will brighten up your anticipation of Christmas. What can be more festive than a Christmas tree? With this merry holiday screensaver, you can already welcome the upcoming Christmas celebrations with a wonderful Christmas tree on your desktop. It's ideal to feel Christmas spirit. The screensaver shows a close-up view of the Christmas tree, so that you can see its branch in every detail. The branch is lavishly decorated with bells of various colors and other ornaments. The Christmas tree stands in the centre of the town square. You can see how ornaments reflect the surroundings: nearby houses and trees. Such a tranquil holiday view will help to remember all kind of people around you and all good things you have in your life. In addition, the screensaver has a soft music accompaniment that'll make you cheerful in no time. You can also set a tune from your own library to create the most favorable combination of images and sound.